Tameeka Time: Tameeka Time Moderates! Tonight! Tonight I will be moderating a live web based art show. 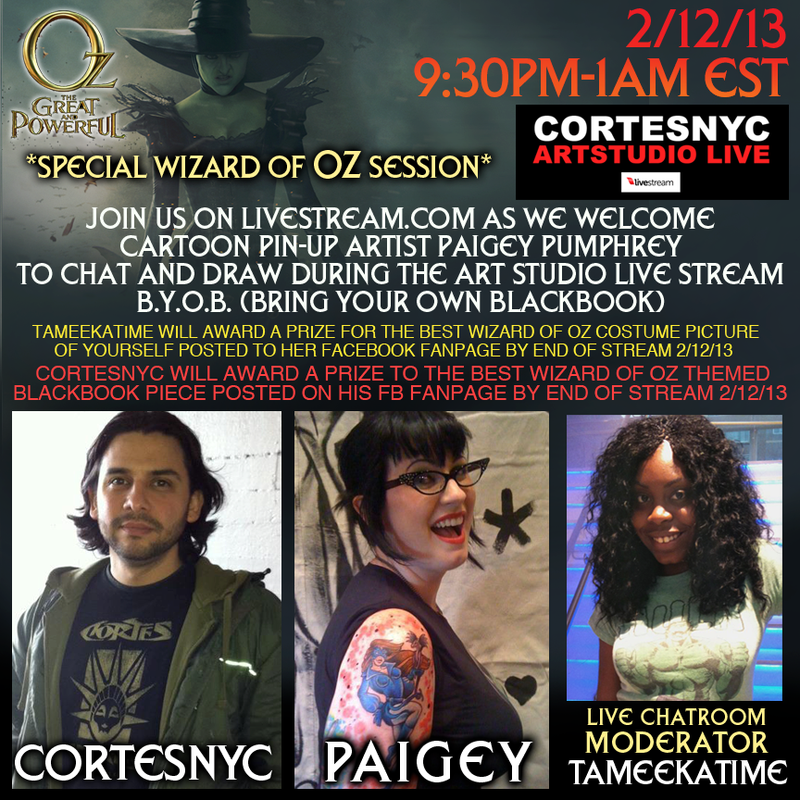 The show is called CortesNyc's Art Studio Live. I talked about it in one of my previous blog posts. Basically Art Studio Live is an extension of Cortes' popular youtube channel. On this show he draws live, answers questions, gives away prizes and I moderate the chat room and operate the different cameras. The show is all web based. You can join the chat room via your computer, your smart phones, or your tablet devices. All you have to do is go to: livestream.com - sign in with your facebook account - search "CortesNyc" and you'll be directed to the show's page. Here's a direct link to tonight's show so you can skip a few steps but it's really simple to join us. This week we'll have a special guest on the show and a theme! The theme is Wizard of Oz. I will be dressing in costume for tonight's episode. And, the special guest is one of my favorite artists. Her name is Paigey and I've spoken of her a few times on tameekatime.com and interviewed her a few years ago. 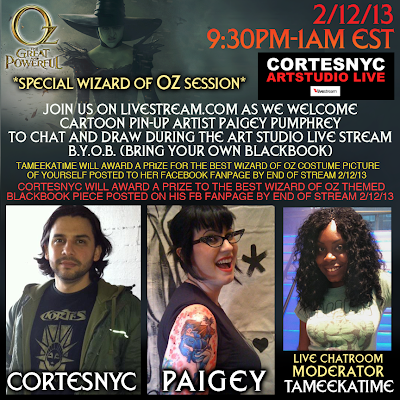 If you like what you see join us TONIGHT AT 9:30 PM EST and find out what Cortes and Paigey are up to. Join the chat room, hang out with us, ask the artist questions, ask me questions, or just come to see the free art being drawn live! I will be giving away a prize to whoever posts a picture to Tameeka Time's facebook fan page of themselves in a wizard themed costume/outfit. The winner will announced at the end of the live stream episode.